On Monday, we got new Sunny Bunny accessories collection. Although not every users is a fan of the particular style, which is logical, there are still some people who like to experiment with stuff they'd never wear in real life or are too afraid to try. There are some really cute items in the collection, with my favorites being the 2 wigs. Cat ears are nice too, but we've had some other versions of them. 2 starcoin items, which are okay. Overall, an okay collection. 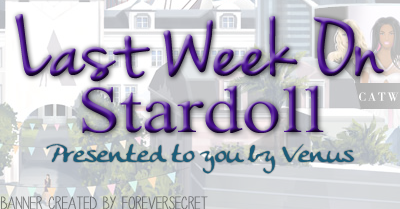 On Wednesday, we got a new collection in (my opinion) the least appealing store on Stardoll. It is an original Future store. I don't know if it's just me, but I get rarely impressed by new collections in the particular store. I am sure some will agree and others disagree. On the second look in collection, though, it doesn't look that bad as I thought. There are some really nice items ready for you to mix and match with a variety of stuff. Some starcoin items, some SS only items, nothing we haven't seen before. Also, a nice idea adding some guy clothes. Stardoll seems to be focusing more on male members than before. Which is good, but let's face it - boys are minority on this game, and they just do not need constant releases. Especially as some prefer collecting girl clothes. And on Friday, a highlight of a week - new Nelly.com store collection. Because, let's just face it, Nelly.com is the best store on Stardoll, considering the affordable prices and excellent quality of a clothes, endless options of mixing and matching and combining, and making everyday look, night out look, casual, trendy, sporty. Stardoll seems to put a lot of detail into recreating each piece from real life collection, and they never fail to amaze me with this store. A lot of praise from me, I know, but it is 100% deserved. On the very 1st look, they don't seem that nice. I am really curious to see how will they actually look for our dolls, but in the meantime, I can say I like boots, both ankle ones or long ones. There is also a jacket with a pose, and since everyone is crazy about Strike-a-Pose, it is an excellent idea including that kind of jacket. There is definitely an Autumn feel to the items, and like I said, I can't wait to see them released. That's it for the week, and as usual, vote, comment, and see you next week.